When we see some conflict between achieving the two objectives …we would consider … just how far we are from achieving each of the objectives and if the distance from achieving an objective is particularly large, it would be consistent with the balanced approach that we would tolerate some movement in the opposite direction on the other objective. The Fed, by statute, has two explicit jobs it needs to balance: price stability and full employment, with no guidance from Congress about how to define or weigh those goals. This is in contrast to most other central banks which typically only have an inflation mandate. What to do? Well, under Chairman Bernanke the Fed choose to define price stability as 2% year over year inflation as measured by the Personal Consumption Expenditure Deflator, a slightly different index than the more familiar CPI. The FOMC also polls its members as to the likely long run unemployment range. 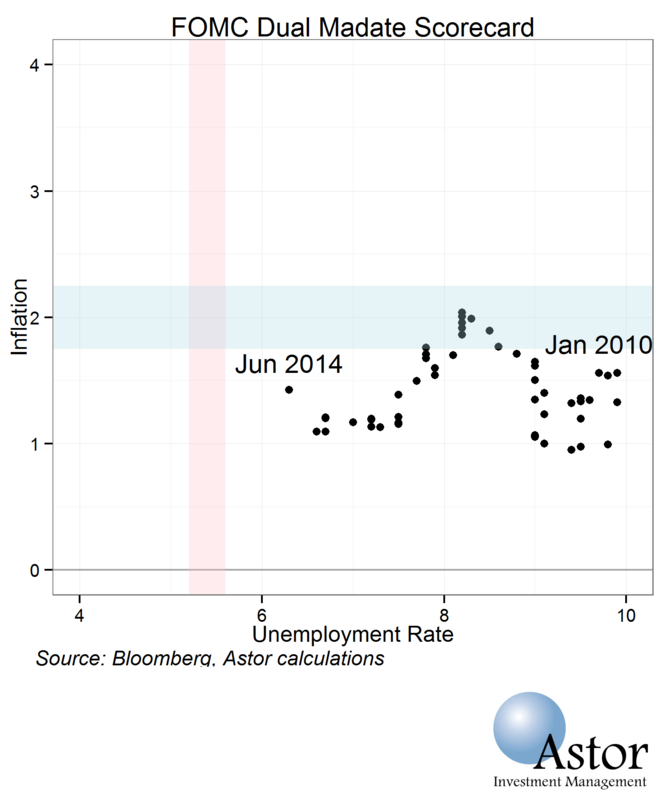 Given that the Fed assumes that inflation is exactly on target in the long run, this is relevant unemployment rate. 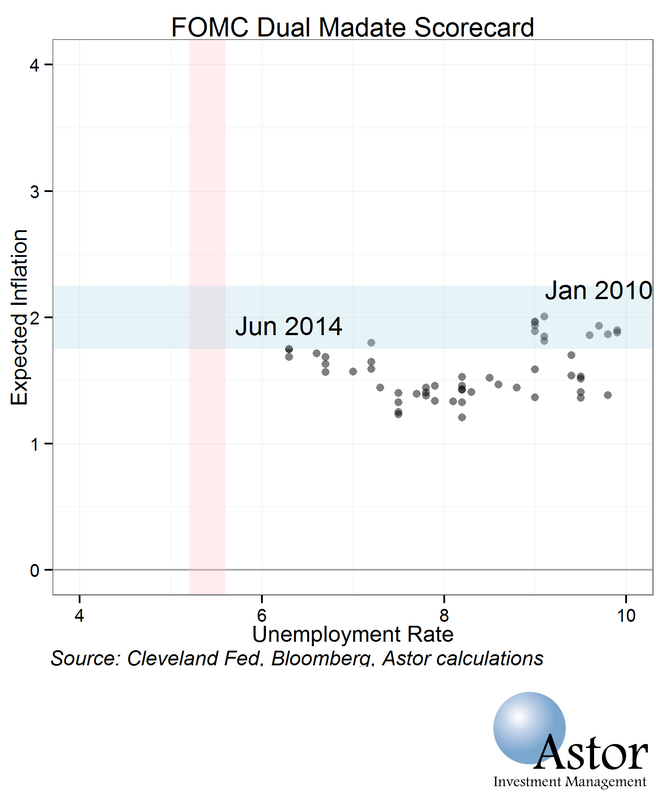 As of June 2014 the FOMC saw the long run tendency for unemployment at 5.2 -5.5%, the projections can be found here. The chart below shows the recent evolution of the Fed’s objectives since 2010 along with the long run targets. The pink band is the long run unemployment rate as of the FOMC, the blue band is the Fed’s inflation target +/- a 0.25% band. The Fed should try to adjust monetary policy with a goal of getting closer to the intersection of the two bands, bearing in mind of course that there is no long run inflation / unemployment trade off. The central insight provided by this chart is that there is no conflict in the Fed’s two mandates: inflation and employment are both below target and the fed has no need to raise rates soon. But the Fed will use its expectations as to how inflation is likely to evolve rather than driving by looking in the rear view mirror. We cannot get inside the heads of the Board, but the Cleveland Fed does put together an interesting series of expected inflation based on professional forecaster surveys and manipulations of some market prices. Our scorecard chart is repeated below, but with inflation expectations on the Y-axis. We can see on this chart inflation expectations over the next 5 years are running slightly below the Fed’s long term target. So on this measure as well we expect the Fed to have substantial room to allow keep rates low. Returning to Janet Yellen’s quote above, it is possible that even if inflation or inflation expectations drift above their target, if the unemployment rate is still 1 percent above its long term level, the Fed may be slow to cut rates. Bottom line: the Fed is not behind the curve on inflation and will not tighten any time soon absent evidence of increased inflation. Janet Yellen gets a passing grade. This entry was posted in Home, John Eckstein, Chief Investment Officer and tagged Employment, FOMC, Inflation, john eckstein. Bookmark the permalink.